New version with me also broke the cell map. warren55 wrote: I just installed the latest version. Nice work, and thank you! The interface is getting better each time. I've only had my car for a couple weeks, so I'm still getting used to things here. When I got it, it showed 104.5% SOH, but now it shows 106.6% SOH. I'm assuming it's just a typical variance like I used to see on my Leaf. The SOH calculation is corrected from SoulEVSpy-0.1.2-2623 onwards. If you upgraded from a version prior to that, the difference is expected. If you want to make sure, look for battery.min_cell_detoriation_pct and battery.max_cell_detoriation_pct in a csv-file recorded before you upgraded, and in a csv-file recorded after you upgraded. I see your images now. I have updated the APK download link to point to the build before the latest. My wife is away with the car, so I am unable to debug and test fix currently. The battery cell map is fixed: It works on my 2015 Soul, and with replay of BlueON, 2018 Soul and 2015 Soul csv files. I have added reading and display of the 8'th temperature sensor (thanks JejuSoul). The dynamic coloring of the map cells has been tweaked a little. I am certainly not a programmer, but is there any chance we'll see future upgrades that would include things like a diagnostic screen where we could see fault codes, or turn the warning chimes off and on, like the Leaf Spy app? If this will work with the new Kia and Hyundai EV's coming out, I'm sure it would be hugely popular and I for one would not have a problem paying for it! 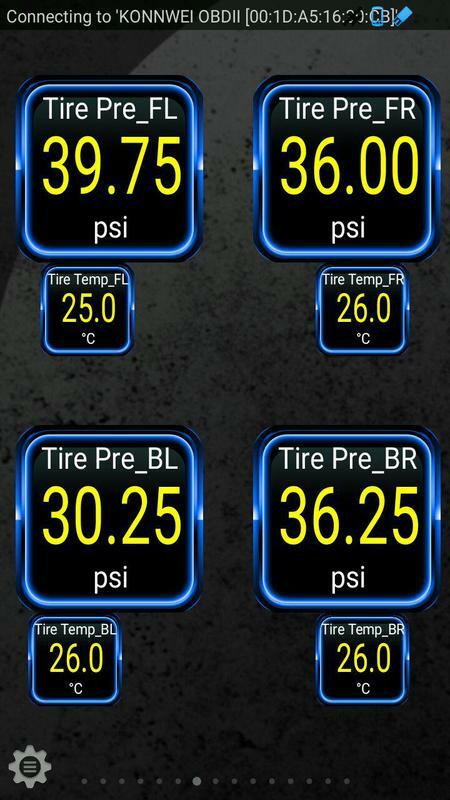 I have version 0.1.3-2912, and set it all to US measurements, but all the screens still show KM, or degrees C.
great info on tire pressure...but which sensor is which wheel? just my thoughts....and I can't find where to get an update (if there is one...) and no link in the app. SoulEVSpy is still beta software. But it has the potential to be a great tool. There has been some good progress recently. Am hoping more developers and testers will help to boost improvements. 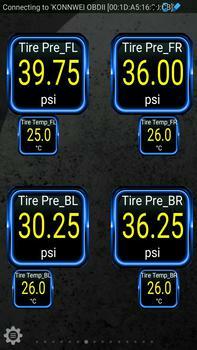 The problem with knowing which TPMS sensor is which, is that the tyres get moved around each time you do a rotation. I had this set up in Torque to show the original locations. This was 50,000km ago. The tyres have been rotated a few times since then, and I did not update Torque each time. I can see when one tyre has low pressure, but to know which one it is I have to go out and actually kick the tyres. 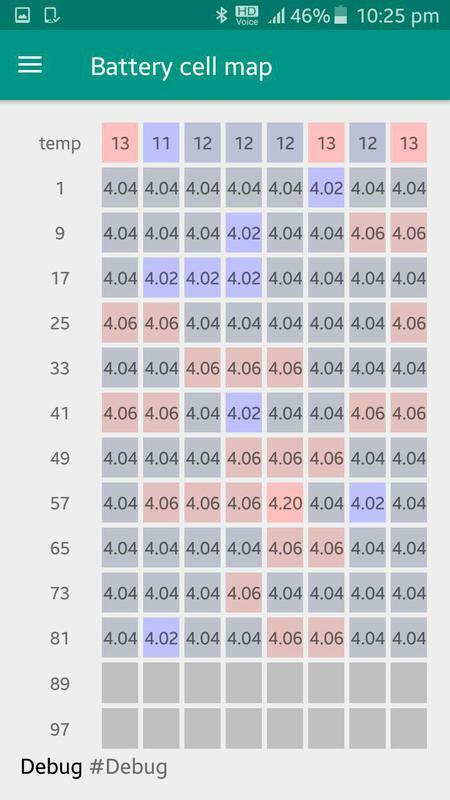 I've laid out the TPMS data in Torque like this. There are also codes for sensor ID which I don't bother to show. Am not sure why the position of the data would move with the movement of the tyres. I should check the sensor IDs before and after the next tyre rotation. Does any one else know what the error is here? My code for Torque? Kia's implementation of TPMS?, or is this always the case with TPMS? I don't know, I only have access to information that is freely available on the internet, no technical documentation. I would love to have the technical docs, that would make it possible to improve the app a lot. "prec SOC" is probably some sort of energy measure, that seem to correlate relatively well with SOC. There are 3 different places where the SOC can be read, one being the one displayed in the car menus, you will find all 3 in the .csv file.